Postcard from Naples 11 - This one is obvious, even if you don't recognize the place. 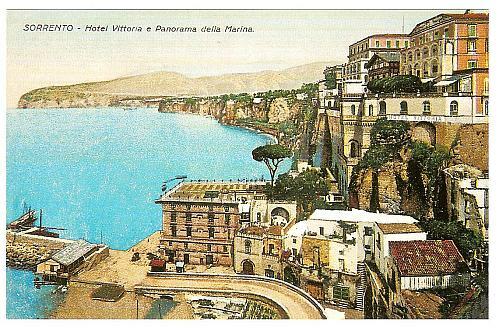 It's labelled for you: Sorrento - Hotel Vittoria and panorama of the marina (port). It seems to be hand-colored, and that might help with the date a bit. Also, if you have been there, you might get some clues from how much the harbor has changed. It is remarkable, however, how little the buildings and the general appearance of the cliff have changed. The card is postmarked (I know because I just peeked!) June 20, 1921—the day before the beginning of summer. It would be the writer's last summer. The note on the back is written in the hand of Enrico Caruso, the most famous celebrity in the history of opera. Caruso was staying at the Hotel Vittoria trying to recover from a lung operation. The hotel is the first building on the cliff and is identified in white letters below the hotel. Not only is it still there, but they even have a "Caruso room" full of memorabilia. (There are other items in these pages on Enrico Caruso at this link.) I don't need to remind you of how famous he was, but just in case, I've read that in 1996 a Washington Post opinion poll voted two Italians among the greats of the previous 1000 years, Michelangelo and Caruso. That's popular. (Michael who?) Did I mention that Caruso was a great practical joker? He liked to nail props to the floor or to a table (maybe a sword that was meant to be picked up by another singer in the course of the opera. He once filled bass Vittorio Arimondi's top hat (a perfect bucket!) with water and waited for poor Vic to put it on before exiting stage left. He did —and took a shower in front of the public. A real card, old Enrico. Thank you for your letter and your kind expressions of sympathy. I noticed your absence but I understand your reasons. I hope you are well and that your way is now clear. The steamer left on time given the presence of a group of young doctors, rather fascist, who insisted that we leave according to the schedule. Good-bye, my dear friend, and give my greetings to your family. Your Enrico. That was in June. Caruso went to Naples shortly thereafter and stayed at the hotel Vesuvio along the sea front at Santa Lucia. He planned to go to Rome to a clinic. That did not happen. He died in Naples on August 2, 1921. "Enrico Caruso" in Napoli in Documenti - Archivio Napoli. Edizioni archivio. Bibbiena, Arezzo. 1994.